Matt says his name as it appears on-screen in the opening titles. David always thinks of Elzar when he sees Emeril Lagasse on TV. John says it is fun when he gets to "play against" himself, such as when Bender and Elzar talk to each other. Rich discusses how hard it was to animate Elzar's four arms, with the scene where he prepares the oysters being very "coordinated". David asks if it is not easier to animate each arm on one side doing the same thing, Rich says yes but it isn't as interesting. Matt jokes that if you want to rip-off a "little creature" from something else you just have to put an antenna on them and it becomes and alien version. David says that Leela is blind in this episode but in season 4 she is deafened, a reference to "The Devil's Hands Are Idle Playthings". As a rule, Fry loses his limbs/head in different episodes but Leela always loses her different senses. The whole scenario of Elzar treating the crew to an expensive meal but then making them pay for it is based on a true story from a friend of David's who writes for The Simpsons. The writer and 10 of his friends (some of whom had met the chef before) were given lots of food, champagne, wine and cigars, but to their surprise, were charged $3500 for it. Matt asks if that is the first use of the Professor's "Sweet zombie Jesus!" line, to which David notes Jesus was mentioned in another episode and they remember the previous episode used the line, too. David says Smitty and URL's lightsaber clubs are a callback to the pilot. Matt says URL was one of the original possible names for Bender. According to David, Fry's line "He's made of candy!" was changed about 80 times. No one can remember any of the alternatives they came up with, so David says they probably weren't so good. Matt said the establishing shots in the animatic for this episode weren't doing much, so Rich added in gags to each one. Rich says the Robot Mafia were a lot of fun to design. They wanted Joey Mousepad to be big and Clamps to be small and wirey. They original pitched big, pointy clamps for Clamps' design. Donbot's hands move a lot when he talks. John says it was difficult to whistle a tune that didn't sound like an already existing song. Pat's Pool Hall is named after Patric M. Verrone. The robot that is shot multiplte times by Joey and Clamps is stabbed multiple times in a scene in season 4. It is discussed how it is strange that Bender gives a thumbs-up but his fingers are all identical. They also mention that the Donbot has rings on every finger. The animators have to make sure the stars outside of ship windows are always travelling in the right direction and at the right speed. They originally wanted to have bigger clamps for Clamps because of the scene when he grabs the Planet Express ship. Zuban cigars get their name from a real-life star, but no one in the commentary can remember its exact name. Matt jokingly says he has a friend named Zuban and he told him that the joke was based on him. 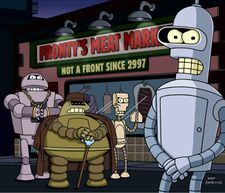 Originally, it was going to be revealed at the end of this episode that Flexo had stolen Bender's life after the events of "The Lesser of Two Evils", but the idea was cut as they thought fans would be very infuriated. David Cohen: I think we changed that line about eighty times. What were some earlier ones, do you remember any? Eric Horsted: [after a brief pause] Nope. This page was last edited on 31 July 2014, at 04:59.